Discussion in 'Misc. Films' started by AdamTheWatchmen, Apr 13, 2006.
if you would like to add more please be my guest thank you. I see the 93 one get dumped on all the time but never much reason why. heh, I liked that movie enough, it's no freak'n masterpiece story-wise but neither was the game so I let that slide. Well Kira Knightly for peach is just fabulous. Mario, that's tough. I'd like to have Hopskins back if possible. If you've ever heard his real accent, you'd be stunned by how well he can sound like a new yorker. What an actor! And Bowser/koopa should be played by VIN DIESEL. There is no other choice currently within existence. 2. Leave the 93 version alone, it was just fine and I like it the way it is. 3. Your plot idea is the most unoriginal plot there is. You sure that wouldn't be worse that the original? The actors should turn into CGI when they wind up in that world.And they should make it where they are a couple of losers playing the game who get zapped into the game somehow. ^Then they should reverse the idea.Have CGI characters living in their Mario world,then one day they are zapped into our world and they become live human actors. Cheech Marin should've been cast as Mario, and keep John Leguizamo as Luigi. They could've been doing a big plumbing job in someone's basement when they are suddenly pulled in through a warp zone into the Mushroom kingdom, where they are talked into rescuing the pricess from the evil King Koopa before going back to their own world. Not much you can do with the game's storyline, it was simple, but the characters are what made the game great and what could make a movie lots of fun. Danny DeVito is Mario, I have no idea who to cast for Luigi, and the 1993 movie is awesome! Oh yeah, and Michael J. Anderson is obviously Toad. people who can realistically play New York City Italian brothers close in age. Not a new york hispanic guy and some Brit who's to date never done a good American accent of any kind that also happens to be and look like 30 years older than his brother. For Peach/Princess Toadstool, some young actress with alot of inherent charisma and intelligence to her. IE: NOT the "Kate Bosworth type". How about Isla Fisher? For Wario you if you cast Artie Lange for Mario you gotta get his evil racist (ok, "more racist") twin Nick DiPaolo. <(o_o)> Evangeline Is My Hero! I would love it if they did a new movie with Mario & Luigi & they would have to include Donkey Kong & go kart racing in some way. Maybe King Koopa captures exotic animals & Donkey Kong is one of his prisoners, so when Koopa gets his hands on Princess Peach Donkey Kong becomes smitten with her so Donkey Kong fights with Koopa & the Mario Brothers over her. 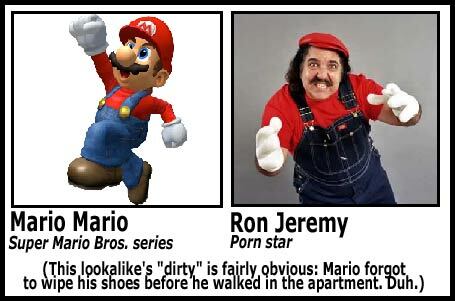 no live action Mario, thank you very much. it sucked more than enough the first time. make it a 3d animation and I'm all for it. Duz anyone know why they didn't use Peach for the 93 version? Maybe they cast Bob Hoskins first and determined that any story focused on him as one half of a love story would be too disgusting so they had to make it about Luigi's love affair. On a related note, Samantha Mathis is one of the most underrated screen starlets of all time. Then again, neither was Bob Hoskins and John Lugizamo, but that was a horirble movie.